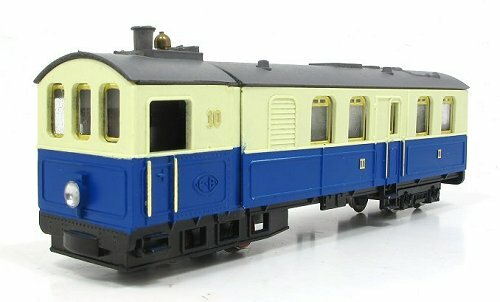 Another slightly random purchase - an Egger Bahn 009 railcar. In my defence, I'd just won 25 quid on a Premium Bond and the sudden rush of cash made me go mad. I've always had a liking for railcars and this was cheap. Hardly surprising as they aren't rare. I picked the cheapest of 3 on the second-hand stall, although I did have it checked to make sure it is a runner first. Looking for a prototype, I posted to Facebook and received the response that it was a caricature - from, possibly, the Rhein-Sieg-Eisenbahn Gesellschaft line. Digging on RMweb brought me this thread, complete with some photos that don't look too far off. The big question was just how well does it run? Some describe their models as working like coffee grinders! Firing up my trusty ancient H&M Clipper, I gave it a go. Maybe the thing will run a bit better on a more modern controller, and it certainly responded to some light oiling, but I have a feeling that we'll be grinding coffee! Mmmm … ground coffee … tasty! Of course, you could always get the stuff ready ground and packaged from a local supermarket. I personally enjoy that own brand "Gold" stuff from Lidl (usual disclaimers apply) - but I am sure you've got your own preferences. Just how many scales do you model?! I'll have a go at anything, although 009 and OO are both 4mm scale, just with different axles so this isn't so far out of my normal modelling.